3 of us getting flights from UK to Carcassonne then onwards to somewhere about 90 mins drive from Bilbao - no match tickets yet but am optimistic on that front ! 4 going in via Santander and 4 direct to Bilbao. Bayonne is are really interesting town well worth a visit !. Took the lazy but expensive option & going with the Killester Travel 2 day trip, still need match tickets though.. Probably the best ever holiday myself and Mrs stays ever had that wasn't our honeymoon. Lucky backstard. Must get you the name of a fantastic bar we found in Biarritz. Specialised in mainly French Cider and Beer. Have never come across another place like it in France. 2 of us flying into Bilboa on Friday and out on Sunday. Staying in Airbnb apartment for the 2 nights in San Sebastian. It's the oldman's 70th so flying direct rather than the indirect (but a lot cheaper) routes. Hoping a few more mates join us as we have extra capacity in the apartment. I have just been on the phone to relatives who live in Bilbao, they are looking forward to welcome us. We should have a blast!!! On the 1pm Ryanair flight to Madrid. Car hire booked. Possibility of 2 spare seats in the car if anyone interested. 4 hours drive to our accommodation in Cerdigo which is 30 minutes drive out of Bilbao on the coast. nice Airbnb booked. All we need now is match tickets. yellabelly1961 wrote: Took the lazy but expensive option & going with the Killester Travel 2 day trip, still need match tickets though.. Likewise! We opted not to take the E165 tickets ("not face value" as they grudgingly mention! ), so are hoping the ST lottery gets us two tickets. Have a feeling that a large number of tickets just as the accommodation is being allocated to tour packages , looking at the Racing Forum can’t see a deluge of their fans travelling. From what I saw of the chart at different stages there were large chunks of the stadium unavailable even from an early stage during the public sale, would say that an All Ireland final would have been the organisers dream or Munster v ASM for that matter, feel strongly that they will be lucky to fill the ground and that they have totally overestimated the numbers of us that will travel. Can clearly see this on our forum with tickets appearing from Northampton and Leicester, there is a big difference in the number of people who speculate on tickets for these finals and those who actually turn up, had one for Lyon a few years ago for the final and didn’t bother going went to Edinburgh last year to be with the ASM supporters and because it is really easy to get to. If you have a ticket for this and are neutral you would only travel based on several factors does the tie capturing the imagination of the general public and is it accessible ?, no matter how much we might like to think for neutrals particularly in England outside of Gloucester this has little to offer, it is not us v Leicester in Edinburgh or us v Northampton in Cardiff and there aren’t two Irish teams in London to fill the place ?. Not saying it’s not going to be a great game if I was a neutral in England with a ticket would this match up bring me all the way down to the Basque Country probably not ?. Three flying into Biarritz Thurs, out of Madrid Sun (1st class train journey down to sleep things off). Staying in San Sebastian for 3 nights in central airbnb. Buses booked to/from Bilbao on match day. Last PESA bus is at midnight. Booked in Dec so really took a punt but knew after the SF last year that we'd be stronger this season. Bring it on! feel strongly that they will be lucky to fill the ground and that they have totally overestimated the numbers of us that will travel. I wish you were right. I have a contact in EPRC here in Dublin and he told me 2 months ago there are no other tickets other than the allocation to the 2 finalists. I have also been onto a friend in Clermont who has been on their fan site and asking all their season ticket holders if there is anyone cancelling their plans and he hasn't come up with anything yet. The final has become an event in it's own right and all the event junkies will want to be there. footrush wrote: Have a feeling that a large number of tickets just as the accommodation is being allocated to tour packages , looking at the Racing Forum can’t see a deluge of their fans travelling. From what I saw of the chart at different stages there were large chunks of the stadium unavailable even from an early stage during the public sale, would say that an All Ireland final would have been the organisers dream or Munster v ASM for that matter, feel strongly that they will be lucky to fill the ground and that they have totally overestimated the numbers of us that will travel. Can clearly see this on our forum with tickets appearing from Northampton and Leicester, there is a big difference in the number of people who speculate on tickets for these finals and those who actually turn up, had one for Lyon a few years ago for the final and didn’t bother going went to Edinburgh last year to be with the ASM supporters and because it is really easy to get to. If you have a ticket for this and are neutral you would only travel based on several factors does the tie capturing the imagination of the general public and is it accessible ?, no matter how much we might like to think for neutrals particularly in England outside of Gloucester this has little to offer, it is not us v Leicester in Edinburgh or us v Northampton in Cardiff and there aren’t two Irish teams in London to fill the place ?. Not saying it’s not going to be a great game if I was a neutral in England with a ticket would this match up bring me all the way down to the Basque Country probably not ?. I've gone pretty much every year to the final since 2011 (missed 2015 due to work), a lot of neutral rugby fans do the same, I know a group of Wasps supporters that travel every year, booking travel and accommodation before Christmas. I'm flying into Santander return for under €100, nice hotel for €75 per night, so those "event junkies" or rugby supporters as I like to call them are already paid up to travel etc and the current stupid fares are not impacting them. Saying that, with a lot of groups of 40 something men there is always one or two who can't travel because it clashes with a communion etc, so there will be some tickets up for grabs. The stadium will be full. ...and we got our two tickets from the draw! Happy days. We left it til now to book, so we did expect it not to be cheap. €1700 is a lot of moolah for the Killester two night option in Vitoria, plus €140 for the tickets, but we appreciate that getting to a fourth final is a rather good problem to have. I do think Barcelona would have been a much better option if Spain was decided upon as the host country. Bilbao just doesn't seem cut out to host such a big event from a logistics point of view. Anyhow, tally bleedin' ho. Great days to be a Leinster and Ireland supporter. Any plans for a Leinster supporter base on the Saturday pregame or on the Friday evening. There are 2 of us coming in on Friday afternoon with 3 more driving from Toulouse on Friday. Planning on heading in for the Challenge Cup final while we're there on Friday night as I presume it's not going to be full. 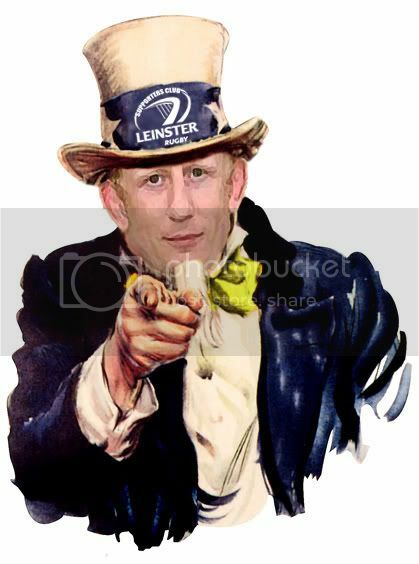 macboomba wrote: Any plans for a Leinster supporter base on the Saturday pregame or on the Friday evening. There are 2 of us coming in on Friday afternoon with 3 more driving from Toulouse on Friday. Planning on heading in for the Challenge Cup final while we're there on Friday night as I presume it's not going to be full. Hats off to Mr Cahill !